This is the latest installment in the Casual Runner Team’s look at products that can help you in your own Casual Running journey. For a look at our other product reviews, just click here. I try to stick to a low carb diet, so working traditional full-calorie sports drinks into my regular training regimen is not really an option (that is not to say, however, that I do not enjoy my pre-race carb loading sprees!). I recently took a look at some different low-carb options for keeping hydrated while also replenishing your electrolytes. 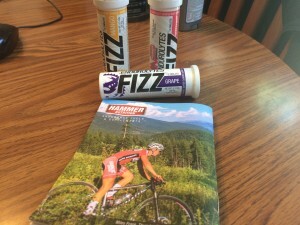 Hammer Nutrition makes a line of Endurloytes Fizz, which are tablets that you can drop into water to flavor the water. You know, instead of just drinking plain water all the time? Each tablet is only 10 calories and has less than 1 gram of carbs, so it fits with my low carb diet. 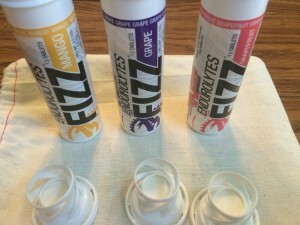 The four flavors I tried are: Lemon-Lime, Grapefruit, Mango, and Grape. Keeping hydrated with water alone can get a little boring sometimes, so looking at options to add a little bit of flavor can be a nice change of pace. I have been known to add zero calorie sweetener to my water bottles on my training run just for a treat on those runs. Endurolytes Fizz offer not only the benefit of flavor, but also Vitamin B6, Calcium, Magnesium, Manganese, Potassium, Sodium, and some other things that I am told are good for me during and after a workout. So, always looking for something new (and tasty), I decided to give these a try. Let’s start from the beginning, I had never tried a product like this before so I was not quite sure what to expect. 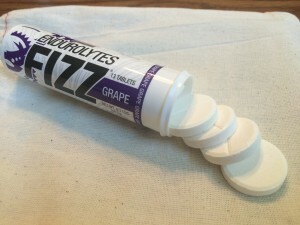 The directions told me to “Add 1-2 Endurolytes Fizz per bottle of water…” Let’s stop right there. Not to get all detail-oriented here, but I have no idea just how big of a bottle this means (Nick may have mocked me for this, but what are teammates for?). In my opinion, the directions are a little ambiguous to say the least. I settled on using a 12 ounce bottle as my standard. Also, it does not say whether you should mix it with warm or cold water (I remember something from my high school science classes about things dissolving faster in warm water, but SPOILER ALERT, I found that, the colder the water, the better this product tastes). Other than that, using this product is straight forward, just drop the tablet (or tablets) in the water. Wait for it (or them) to dissolve. Maybe mix it up a little bit. Then drink it. Was that really so difficult? Again, I really did not know what to expect from these products, and I guess I was thinking they would taste a lot like Crystal Lite, Mio, or Powerade mixes, but these products are not really in the same class as those products – at least the way I see things. I really think these are more like creating your own seltzer water, and not just because of the fizz. To me, seltzers (which I used to drink a lot of, but not so much any more), tend to be more muted flavors. So, if you like lighter flavoring to your beverages, this may be a very good product choice for you. However, if you like a stronger flavor in your drinks (i.e., you were the kid that mixed your Kool-Aid super strong and drove your parents crazy when you did, because, let’s face it, all that sugar would make any kid start bouncing off of the walls), then you may not find the flavoring to have enough kick, even if you do use two tablets. I am definitely a two tablet guy, a single tablet just did not deliver enough flavor kick for my liking. Now, the flavors. Since initial impressions are important when you are buying new products, I will share mine. When I looked at the four flavors, I expected that I would like grape the most, followed by Lemon-Lime, Mango, and then Grapefruit. OK, I really did not want to try Grapefruit at all. I had some mental block about it. I am just not a fan of grapefruit itself (feel free to write to me or yell at me on Twitter and tell me how wrong I am because it is a super food), but it is just not my thing. So when I set out on my testing, I saved grapefruit for last (or, tried to avoid it altogether on some subconscious level). After trying the flavors, I was surprised by my results. First, like I said, 1 tablet was not enough for me, but once I played around and tried 2 tablets per 12 ounces, I started to appreciate the flavors. Others will be satisfied with 1 tablet. I suspect that if you need 3 tablets, this may not be the class of products for you, at that point just go back to Kool-Aid and all of its carb-laiden sugary goodness. To me, Lemon-Lime was far and away my favorite. I am not sure if it was because, with the fizziness, it reminded me of Sprite, but it was really good. For much the same reason, Mango was really good as well and launched itself up to #2 in my flavor rankings. Grape, which was my pre-season #1, fell to #3, not because it was bad, which it wasn’t, but I think I expected a more impactful flavor from it. So, while it was good, it could not overcome Lemon-Lime or Mango in my taste rankings. That brings us to Grapefruit, the prodigal son of flavors. Yes, I really struggled convincing myself to try it, until one day my buddy Dave saw the tablets sitting on my counter and jumped at the chance to try them. He LOVED the Grapefruit. I mean LOVED it (he was a 2 tablet guy as well). So I finally convinced myself to try it, and well, I didn’t hate it. It is not a bad product at all (remember, Dave loves it), it just is not my thing. If something is not on my flavor palate, I really do not want to eat it. So take that recommendation with a grain of salt. In the end, that is the important lesson to take away from these reviews: they are just our opinions and what does/does not work for us. We hope we can give you an idea of what might work for you, but, especially when it comes to flavors, like Dave and I proved, some people just like different things. Neither Mike nor Casual Runner received any compensation for this review. The products reviewed herein were provided by the manufacturer for purposes of this review and the opinions are solely those of the author.